Registration opens online on Monday, February 18, 2019 at 9:00 am. Online registration only. Held on the serene campus of Round Top Festival Institute, Poetry at Round Top is an annual festival presenting the nation's most exciting and prominent poets over three days of readings, workshops, and conversations on craft. Featured Poets include Major Jackson, Marie Howe, Benjamin Sáenz, Vievee Francis, Forrest Gander, Natalia Treviño, Sherwin Bitsui and Bruce Noll as Walt Whitman. Musical Program TBA. View biographies at Poetry at Round Top/2019 Speaker Bios. 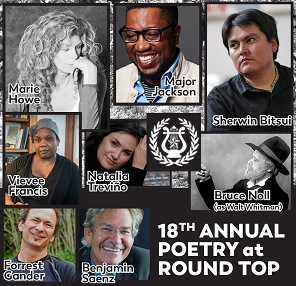 The Schedule of Events for the three-day weekend will be posted on the Poetry at Round Top website. Workshops. Festival Registration is required plus $40 fee for each workshop. Full descriptions for the optional workshops are posted at Poetry at Round Top/Workshops. Manuscript Consultations. Festival Registration is required plus $75 fee for the private consultation. Manuscript consultations are offered in 30-minute sessions. Email poetryatroundtop@gmail.com for more information.